This is good weather for staying in to work with a cat hanging around in your general vicinity. The sun comes and goes, and never stays long enough. 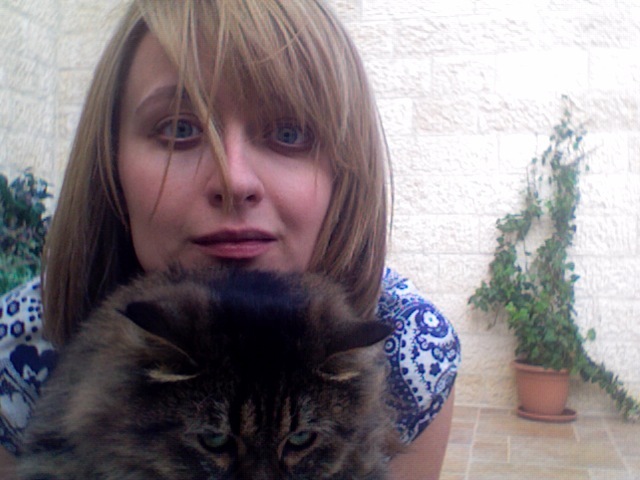 I recently fished out this picture taken with Fanty in Amman, shortly before leaving for London earlier this year. There’s something about it. That entire “photo-session” completely captures the certain feel I have for Amman, how I both love it and don’t love it. I like this picture because of the way Fanty’s eyes look specifically. He looks so testy that he’s practically an extension of me here. He’s like one of those shadows in fairy tales that take on a specific shape that’s based on something that goes unsaid in that particular moment. Being in Kiev right now, I’ve been comparing the two cities in my mind, and the one definite parallel I see is how rich both of these places are. And no matter how stratified the society in either place, you can’t put up barriers between yourself and the people you come across. Both Kiev and Amman are like bigger, more developed versions of little Durham, North Carolina, where I went to college. Maybe there’s something in the stars about being attracted and attached to certain places like that – places that are raw, with bad pavement and drama and people you love. I love Spektor’s voice. It’s so naughty and sweet. I was delighted to hear it again when jumping into a friend’s car in the middle of a rainstorm in Kiev (here’s one thing that Amman most sorely lacks – summer storms). I didn’t recognize it at first, but the warmth washed over me, and I felt as though I was steaming on the inside. Thanks to the people who have been providing me with music as of late – you guys have NO idea how awesome it has been. Or maybe you do. Having seen this picture before, I’ve just got to say that it is one of my favorites of you. If not the favorite. The United States misses you, girl.